Well we have some, rather slow progres on the Brood Lord. I'm utterly amazed at how many layers of detail this sculpt has. Just in order not to mess up everything while moving on to other areas I'll have to do several arms seperately and started first on the rather complex base. I was really stuck on the termi heads though, and that was pretty much where I needed to start as he's holding one in a claw which will be inaccessible once I start on the skin. So after 4-5 testheads that didn't work out due to wanting to do 7 different heads I've just settled on using my Relictors colourscheme on all of them. They are unlucky geezers anyway, so loosing some termies to a Brood Lord is in character. Really enjoying putting more purple into my overall Tyranid colourscheme. First off, it really helps to break up all that read. 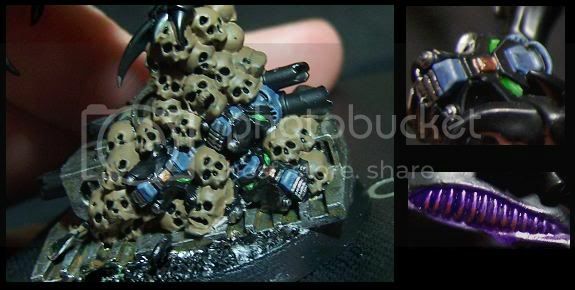 Secondly, I just really enjoy painting 'organic' purple. On symmetric stuff like power armour or vehicles I don't have half the fun compared to doing little segments like this. Just 1 more day to finish this critter, it's going to be tight! After that I'll have 12 days left for the Trygon I've been putting off for about 2 years now. Should be interesting! Broodlords definitely have plenty of detail to pick out! 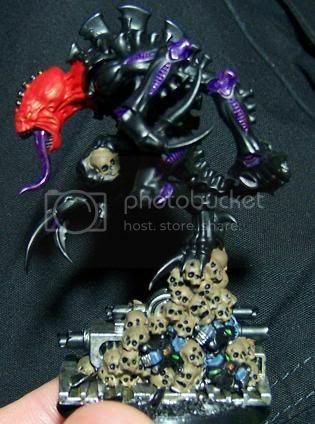 So far my broodlord is the only thing out of the genestealer portion of SH that I am even close to finishing.